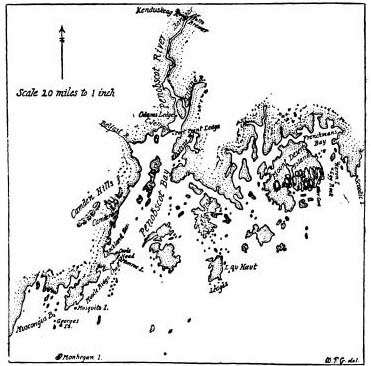 Map of Mount Desert Island and the Pennobscot Bay from Champlain's description, by W.F. Gangong, 1911. The first coastal exploration after the founding of Saint Croix Island took place in September 1604. Pierre Dugua himself commanded the first voyage along the coast of what is now Maine. Samuel de Champlain named Mt. Desert Island and the Isle au Haut in his journal during this journey. Champlain wrote about interactions with Native Americans along the shorelines of the surrounding areas. Archeological investigations on Mt. Desert Island and Isle au Haut found native settlements along the seashore, as well as shell middens containing ceramics and tools. "That same day we also passed near an island about four or five leagues in length, off which we were almost lost on a little rock, level with the surface of the water, which made a hole in our pinnace close to the keel. The distance from this island to the mainland on the north is not a hundred paces. It is very high and cleft in places, giving it the appearance from the sea of seven or eight mountains one alongside the other. The tops of them are bare of trees, because there is nothing there but rocks. The woods consist only of pines, firs, and birches. I named it Mount Desert island. Its latitude is 44° 30'." Today, four hundred years after the French arrived, the Passamaquoddy and other Native Americans still live in the region. The Passamaquoddy have oral histories that go back to Champlain's arrival on Saint Croix Island. Much of the park was charted and explored by Champlain during several voyages down the coast. Today, visitors can compare the modern landscape with Champlain's descriptions. Located on Mt. Desert Island, visitors can see artifacts of the native tribes of Maine. Learn about the people of Maine and the cultures who have inhabited this region for generations.